View of a bridge in the Yorkshire village of Yedingham. Yedingham lies on the bank of the River Derwent on the edge of the East and North Ridings. 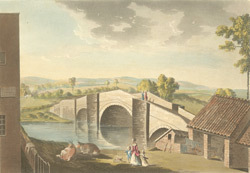 The bridge was built in 1731 and has three arches. From here small craft could travel down the Derwent to the Humber. There was also an inn near the bridge.